I'd forgotten all about this ghostly article by legendary Melbourne book dealer and Penny Bloods collector, John P. Quaine. It also appeared in The Argus, in January 1938, and mentions Roy Bridges' A Mirror of Silver at the end. doth close behind him tread!" It is no use any longer disguising the unwelcome truth that we are living in an age of terror. I am not alluding to any of the numerous political and social worries over which the world weeps at present, but to another and (from the bookman's point of view) more unwholesome development. Leering at us from every bookstall to-day is a bewildering array of ephemera devoted solely to alleged tales of terror, horror, and associated frightfulness. In every case the coloured wrapper is garnished with the portrayal of a fear smitten maiden in the clutches of a ghoul-like creature busily engaged in putting her to death by some unimaginable method of maltreatment. It is only just to mention that the terror goes no further than the wrapper. The "nerve-jolting tales" describe the menace of unearthly love-makers. Usually the heroine takes a midnight stroll through a lonely, forest, crosses a glade, and encounters a select company of the "undead dead" dancing merrily on the moon-kissed sward. She discovers, of course, that they are not nice people to know. These tales, so unutterably wearying in their straining after thrills, add nothing to the world's ghost-lore, and they are merely conducive to profanity. Students of the uncanny in literature positively refuse to enthuse over the antics of corybantic cadavers. No simple scribbler can write a readable ghost story. Like an effective painting, it has to be the work of an artist. Surrealism in the field of the phantom is out of place. The Rev. Montague Summers, the world's greatest authority on terrific literature, avers that only those who believe in ghosts can write about them properly. This is a somewhat debatable point. H. G. Wells and other writers who scout the idea of supernaturalism have produced some excellent ghost stories. The authors of such narratives, like the ever increasing army of people who collect them, are men and women of all shades of belief - or none at all. The ghost story enthusiasts, whether they believe in veritable psychic phenomena and are familiar with the activities of the doppel-ganger, polter-geist, wraith, or revenant, or, on the other hand, laugh at such manifestations as subjective hallucination ("plain hooey," in modern American), are united in their appreciation of the story-as a story. So we of the Bug and Goblin Brother-hood are not concerned with the truth or falsity of any of the choice items we prize. Allegedly true accounts like Dale Owen's "Footfalls on the Boundary of Another World," Mrs. Crowe's "Night Side of Nature" (a classic of legendary lore), or the scores of purely propagandist volumes issued from the era of the "Rochester Rappings" down to our own time find room on our shelves alongside such avowedly imaginary tales as Stevenson's "Body-snatcher" or Bram Stoker's "Dracula." Now the collecting of ghost stories does not mean cramming our shelves with everything relating to the debatable land. Were it so, even the most modest collection would more than fill our Public Library. Only the very rare volumes or those produced by master hands are worth shelving, and the innumerable stereotyped tales of benignant or malignant phantoms gliding through dismal corridors may be classed with the modern ephemeral literature already alluded to. The very air breathed by the specialist in supernatural lore is impregnated with warlocks, witches, vampires, ghouls, boggles, trolls, leprechauns, and banshees. The orthodox spectre, with warning finger uplifted, plays only a small part in the great ghastly drama displayed before the mental optics of the occult student. Of all the terrifying performers in these supernormal romances the vampire is universally regarded as first favourite. The vampire was rare in English literature before the beginning of the 19th century. On the Continent of Europe, of course, he was always a commonplace. Then Byron introduced us to one in his "Giaour"; Southey had another in his poem "Thalaba," but there was nothing in prose form until Byron's slight fragment, upon which Dr. Polidori based his gruesome story, so long attributed to Byron himself. This tale, it will be recalled, was, like Mrs. Shelley's much abused "Frankenstein," the result of that famous gathering at Geneva in 1816. I am sure Coleridge's "Christabel" would have been a very fine vampire story, but just as we are beginning to appreciate the lovely Lady Geraldine the poet stops dead and refuses to finish the narration. It remained for the father of all modern phantastic stories, Le Fanu, to finish the adventures of the sprightly lady. His tale "Carmilla" seems built upon Coleridge's fragment, combining the dreadful terrors of Prest's "Varney the Vampire or the Banquet of Blood" with the eerie suggestiveness of "Christabel." The more modern "Dracula" is only an enlargement of "Carmilla," with sundry additional horrors thrown in. Le Fanu, curiously enough, was neglected for many years; you will search the pages of encyclopaedias and bibliographical dictionaries in vain for any reference to him. With the exception of a memoir in the "Dictionary of National Biography" he was ignored until recently, but now at last he is coming into his own. Le Fanu admirers here and abroad are still engaged In identifying his unsigned fragments which appeared in various publications. The list is not complete, but we are hopeful that eventually some-thing like a collected edition of his works will be published. Besides the many ghost stories which rely on sheer horror for their sensation there are the hundreds of humorous supernatural narratives which abounded in old-time periodicals. These, as long as they do not end with a natural explanation of the phenomena (which renders a ghost story null and void In the eyes of the cult), are added to the collector's bag. Thus Ingoldsby's "Spectre of Tapplington" (a prose piece apart from the "Legends"), Samuel Lover's "Stories and Legends of Ireland" (all pure burlesque), and other note-worthy works which have embodied tales of the supernatural, humorously illustrated, are allowable in a ghost collection. Tales of witchcraft, of course, rank next in popularity to the vampire stories, and of these Harrison Ainsworth's "Lancashire Witches," with all the plates by Gilbert, is the rara avis. Australia has contributed little to the literature of Ghostland. For years we had to be satisfied with "Fisher's Ghost," and that unfortunate spectre had to work overtime. It is rather surprising that more has not been done in acclimatising the old world phantoms. It may be that we are lacking somewhat in tapestried chambers and baronial halls, which seem so necessary for a self-respecting spectre during his nocturnal perambulations. Still, there is ample scope for such work. Scenes of violence (more sordid, may-hap, than those which sent forth the oversea phantoms on their wanderings) were common enough in our early days, and the sin-expiating beneficiaries would be passable substitutes for the bewigged or beshackled wraiths of Europe. Our own Roy Bridges, however, be-stowed a boon on the Brotherhood of the Bug and the Goblin when he wrote his "Mirror of Silver." It finds pride of place in many a ghost-lover's collection. On a yuletide note, the following article, from the 12 December 1936 issue of the Melbourne newspaper The Argus, may be of interest - a rare insight into the history of these popular Victorian annuals. Roy Bridges was a Tasmanian author of popular novels and tales who lived for most of his life with his sister Hilda, herself a noted crime writer. The copy of "Beeton's Christmas Annual" is faded and fingermarked. It is musty with the burial of years in a deal chest, dating from the Portsmouth lad who, in 1817, left his ship to settle in Van Diemen's Land. The book was a Christmas gift to a youngster of this Tasmanian farm in the eighteen-sixties. The title page bears his name; a stone in the Sorell Cemetery has borne the name for years. Not all the fingermarks, of a Christmastide stickiness, could have been his. Possibly none was, for his youth was of a time when a new book was rare and precious in the farmhouse. Even a paper-covered book must have a brown paper wrapper put on to protect it. This book, like all the children's books of the farmhouse of his time, came down to other generations because of the care shown through the eighteen sixties. So the "Annual" survives, draggle tailed, disreputable, and dog-eared, but bearing, from its shred of paper cover to its last worm-eaten page, a record of the pleasure it has given to youngsters from one generation to another down 70 years. Not that the "Annual" was a children's Christmas book and no more. The idea of the publisher was Dickensian - Christmas was an affair for family and friends, and for young and for old. The "Annual" was planned to amuse the adult as well as the juvenile. Clearly it succeeded, for this number - for 1865 - was the sixth of the series, edited and published by S. O. Beeton, of the Strand, London, and written, illustrated, and decorated by authors and artists who could conjure up the spirit of Christmas on sound old English lines. So the "General Contents" range from "Beautiful Helen" - F. C. Burnand's parody of a Greek comedy, not of his best work, but meant only for performance in the "Theatre Royal, Back Drawing-room" - to "Amusing and Curious Card Tricks" - were card tricks ever amusing? Certainly the pages of funny pictures by Charles H. Ross are really funny - illustrating the sort of jokes folk at Christmas parties would see very easily when they were in a seasonable mood and were beginning to see double, before beginning not to see at all. But the quality of the "Annual" for entertainment-and its real quality lies in the ghost stories, collected as "Hatch-ups," or "Tales Told in the Dark" - the chief section of the worthy old Christmas book. The tales are told by youngsters in a dormitory at the Rev. Jabez Owlthorpe's school - the idea recalls David Copperfield’s telling his stories to Steerforth and his fellows at Salem House. Mr. Owlthorpe's young gentlemen listen and thrill to, or laugh at, the yarns spun by their fellow with a skill that suggests an early development of literary talent. The usher seems a distant relative of Mr. Mell. Regardless of discipline, he listens secretly in the darkness, and nobody suspects his presence till he is due to take the floor and to reveal a gift for the ghostly decidedly suggestive of J. S. le Fanu. A deep sigh is heard from the middle of the room –a low, wailing sigh: "Gentlemen," says a solemn voice, "pardon the intrusion, but I have been an undetected listener to your stories." He has interrupted, not to do his duly to the Rev. Mr. Owlthorpe and the young gentlemen, but to reveal himself as an authority on the awful. Nobody is afraid of him. Matched with the ghostly, ghastly, and ghoulish creatures of imagination, the poor, shabby-genteel usher simply docs not matter. "Since I am here," says the usher, “shall I tell you a ghost story? Shall I tell you of a ghost that sat upon a rail in Australia, with the moonbeams shining through him, till his murderer was brought lo justice?" "Well," says the usher, "will you have the story of some other ghost not yet introduced to the public?" “Yes, if it’s jolly horrible!" “I must be a poor hand,” says the usher, "if I can’t make you feel like fifty eels running all over your body, and if I don't set your hair on end, so straight and so stiff that it pulls you out of your boots. I'll permit you to call me a humbug!" They tell him gleefully to go ahead. “Well," he says, "I have seen so many horrible things in my life, boys that I scarcely know what particular horror I shall put forth for your benefit to-night. I have heard of ghosts who were torn cruelly from their fleshy tenement by murder, walking to and fro on the earth till the appointed day arrives, when, in the course of nature, they would have died, until which time they had no right to enter the abode of spirits. So they wandered restless through the world without a home, haunting houses, sitting on graves in churchyards, or walking in lonely places There was a soldier at Perran buried alive, and his spirit was often seen at night haunting the new-made graves, tearing at the earth, as though he thought any poor creature like himself was buried living." The moonlight suddenly streaming into the room discloses the melancholy usher, leaning his pale face on one hand, and holding up the other to impose silence while he fixes his large, prominent eyes on the darkest portion of the room. All eyes follow his, and for a moment several nervous youngsters take a long bolster lying on the floor for the corpse of the dead girl sewn up in her shroud, and floating in the sea. The ticking of a watch grows loud and ghostly “a very death-watch in sound,” and the low growl of the dog downstairs seems to warn the approach of a ghostly visitant. First the usher tells that his cousin Phoebe died on her way to India to marry Captain Herbert. On the night of her death her lover dreamed that he saw a woman’s hand floating towards him, he was on the seashore, and the waves cast it up at his feet. On the fourth finger of the hand was the diamond ring which he had given to Phoebe. He took the ring and read within it: “Died at sea on 10th September 1845.” On the arrival of the ship the ring was sent to him at Calcutta by a fellow passenger with a letter stating she died on 10th September. Now as a girl Phoebe was one of a wedding party at the old chateau which was haunted. A white face showed from the wall in the lumber room upstairs. First a little girl who had been sent up to the little room in the turret to look for an embroidery frame came rushing into the drawing room, white as death, and went off into violent hysterics. After the “usual amount of hartshorn and fuss,” she shrieked out, “Oh don t let me see that horrible face again!” Quietened and consoled she told that looking from the wall she had seen a woman’s face - a face white as snow with dark hollow eyes and an expression of unutterable horror. The room was searched, nothing was found. Wedding guests crowded into the chateau. The room, brightened with a glowing stove, was allotted to Phoebe’s brother Jack. He was about to go to bed late that night when he saw in the wall- “a face, dead, white, and ghastly, staring at him in a fixed and awful manner.” He rushed from the room, and roused Captain Herbert; again search revealed nothing. The young man did not spend the night in the room. Next day was the wedding day. Phoebe ran up to the room, thinking to find her brother. Not finding him, she turned to go – when, suddenly, she saw in the midst of the wall a ghastly face, whose eyes met hers with a look of such unutterable anguish that she fell on the floor in a swoon. After that, thorough search was made. High up in the wall a deep hollow was found – a stone had been left out from the masonry. From it a skull grinned at the searchers. It was resting on an iron collar. Long black hair and bones had fallen in a heap into the deep hollow space of the wall. Far back in the Middle Ages a girl, in chains, had been built up in the wall, with an iron collar set around her neck. “We never heard the story,” the usher tells. “Perhaps, in the old cruel days when she died, the peasants feared their feudal lord too much even to whisper it among themselves, and so the tale of her wrongs, her crime, and her death, was lost in the world forever. Irvin S. Cobb was the first to be interviewed, because his day starts at eight in the morning and because the only time to ask him questions is before he leaves his Park Avenue home. "I don't like to work at all," said Mr. Cobb. "I'd never work if I didn't have to. When I do work, which is every day, I sit wherever there is a place to sit, take a pen, a pencil or a typewriter--in the city, in the country, on a train, on a ship, and I work. I have no moods. I don't need to have the light over my left shoulder. The only thing I need is an idea. I am always at work early in the morning. I was raised on an afternoon paper and I do my best work before noon. I never work at night. I do not care who is around while I am working. Ordinary noises of the city do not bother me in the least." Robert W. Chambers is another man who does not like to work. But few Wall Street men toil such long hours as this author whose fiction has brought him as much wealth as if he were a successful financier. Mr. Chambers does his year's work in the winter months so that he may be free to play all summer. He does most of his writing in New York because he finds fewer interruptions in the city than in the country, and fewer distractions for the author. He finds October and November the best time to work in the country, "because every one else is in town." Mr. Chambers never works at night, and he is always on hand for a dinner party. 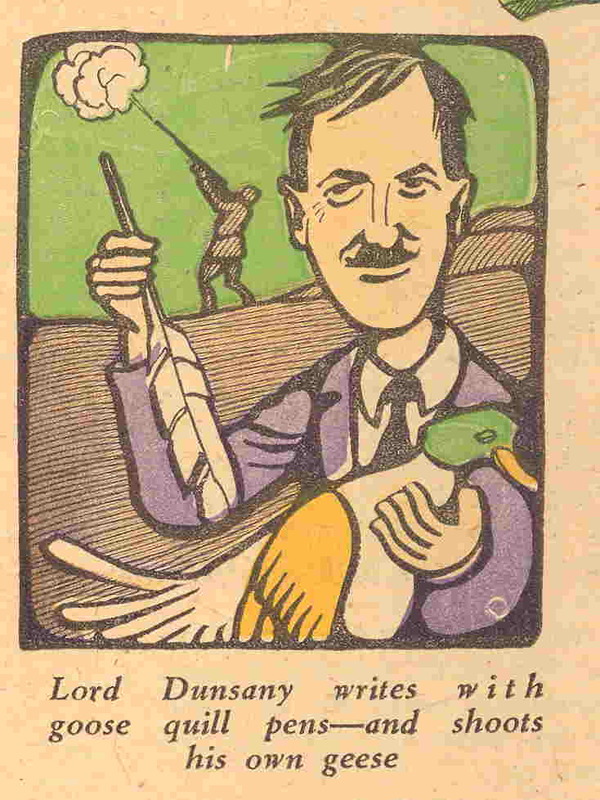 Lord Dunsany's plays have been written with quill pens. In Ireland he shoots geese for recreation. He takes the quils to London, and on his desk in his home in Cadogan Square a dozen quills are crowded in a jar. 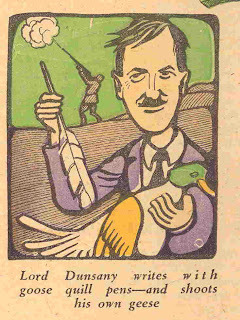 The illustration of Dunsany is reproduced above. Either the artist was ignorant or misinformed, but no type of goose has a green head. Presumably the artist was drawing a common mallard, but that's a duck, not a goose. And a duck feather would not be as handy to use as a writing instrument as a goose feather, which is significantly larger. In my reply to the good news that a two volume set by John Locke, entitled Ghost Stories, and devoted to the since long gone magazine Ghost Stories, was recently published, I was glad to mention a little booklet (it numbers 32 pages) that I bought a long time ago. I think it is the first study in regards to Ghost Stories, and am happy to post its cover here. The bibliographical elements are: James R. Seiger, Ghost Stories, stories of ghosts, 'Neglected Repository Of Supernatural Fiction', essay by Sam Moskowitz, index by James Seiger, 'The Apparition In The Prize Ring', story by Robert E. Howard, introduction by Glenn Lord, Opar Press, Evergreen, Colorado, May, 1973. 32 pages. How did the magazine look like? See here for depictions of 21 full colour covers. John Locke, with his Off-Trail Publications, has quietly been producing some excellent books for anyone interested in the pulp magazines, and especially for those of us who, in particular, are also interested in the men and women behind the stories—the authors, editors, and artists. One recent release deserves special attention for the exemplary coverage of one particular pulp magazine, Ghost Stories. It ran for a total of 64 issues, from July 1926 through the December 1931/January 1932 number. 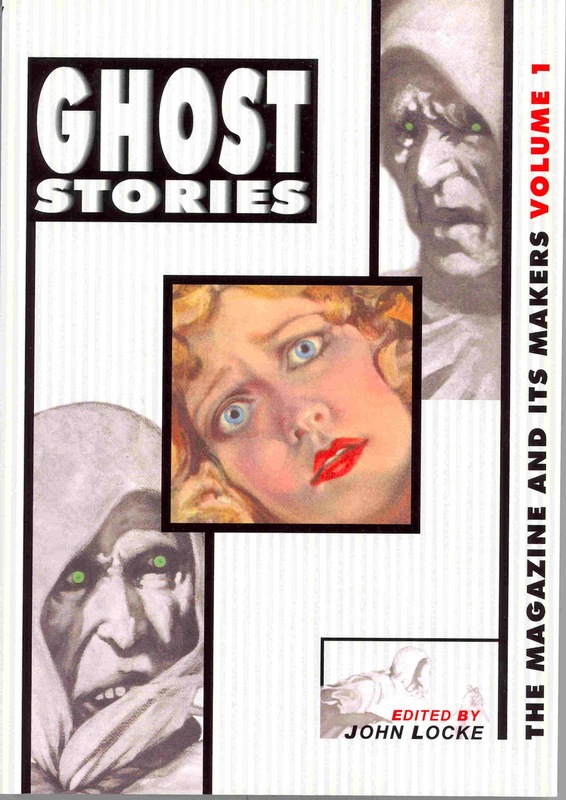 There has been one previous anthology centered on this pulp: Phantom Perfumes and Other Shades: Memories of Ghost Stories Magazine (2000), edited by Mike Ashley. It contains seventeen stories, along with a history of the magazine by Mike Ashley, a short Foreword by Hugh B. Cave (who contributed two stories to the magazine in 1931), and two appendices: the first a checklist of issues of the magazine, the second an index to the contributors. John Locke’s new project brings us not one but two books: twenty stories in volume one, and another fifteen in volume two, with no overlap of stories from Mike Ashley’s anthology and with plenty of extras. These volumes are formatted the same size as the original pulp magazine, so you get some neat extras like a sprinkling of facsimile ads, a bunch of the original illustrations to the stories, and full page reproductions of all sixty-four covers to the magazine. 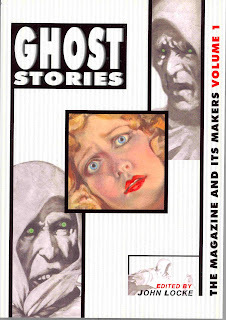 Ghost Stories: The Magazine and Its Makers, Volume 1 (9781935031093 $24.00 trade paperback) additionally includes a lengthy history of the magazine, putting it in the context of other magazines of the time, particularly those published by MacFadden Publications, who were responsible for nearly four years of the run of Ghost Stories before it was sold. Other lengthy sections give biographies of all of the editors, and all of the authors who are represented in volume one. And these are not the usual short one-paragraph biographies, but often a couple of pages, giving the results of original research on these people. There are also some statistical analyses of that magazine, showing that it paid 2 cents a word under MacFadden, but slipped to 1 cent (and up) under later owners. Over its run, Ghost Stories published 517 short stories, 12 novelettes, 47 serials (of various installments), 148 nonfiction items, 44 editorials, and one poem. To mention only a few of the stories reprinted in these two volumes, H.P. 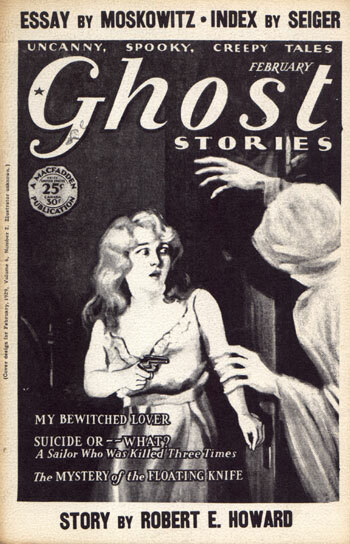 Lovecraft’s friend, Muriel Eddy, is represented with a short “True Ghost Experience” from the April 1926 issue. Nictzin Dyalhis's single contribution to Ghost Stories, “He Refused to Stay Dead” (April 1927) which had been announced in the previous issue as “My Encounter with Osric, the Troll”, is also reprinted. And Leonard Cline, author of God Head (1925) and The Dark Chamber (1927), is represented with his pseudonymous story “Sweetheart of the Snows” (August 1928), as by Alan Forsyth. It’s is a tale reminiscent of Algernon Blackwood’s “The Glamour of the Snow”. Cline’s title for the story had been “The Lady of Frozen Death”, and his typescript version under that title can be found in the booklet The Lady of Frozen Death and Other Weird Tales (Necronomicon Press, 1992). 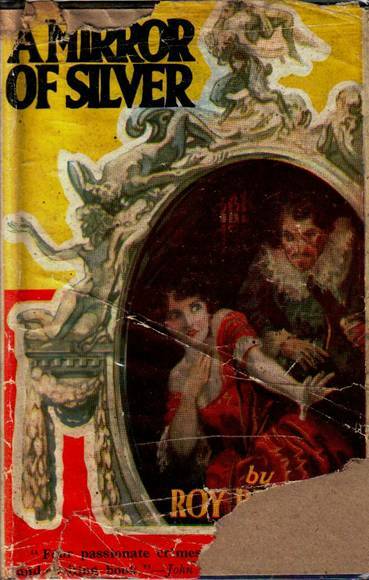 Comparing the texts, one can see that the editor at Ghost Stories made numerous minor changes and additions, ones which tend to lessen Cline’s distinctive style and to add more pulpish sentimentalities. This two-volume history and anthology brings the pulp magazine Ghost Stories, defunct now for almost seventy years, vividly back to new life. I recommend it highly.